Stitching is a hobby for many people. But when it comes to professional sewing, you need to speed up and increase your efficiency. And that is not possible with conventional methods of sewing. When it comes to getting the work done faster and much more easily, you need to go the other way round- use hacks that will speed you up. Here we have compiled the best sewing hacks of all times that are made to change your life and make it a piece of cake. After you have learned them, you will mock yourself that you used the boring and time taking methods. Curious enough? Read on! When you are threading a needle, apply some hair spray on the tip of the thread or wet it with water. It will stick all the open ends and make the passing of the thread through the needle easier. Keep a magnet with you so that you can pick any spare needles and pins at one place. Instead of spending dollars on the small cones of thread, buy one giant roll and use it for a longer time at lower prices. Do not hand sew buttons. Use your sewing machine to get them done. Use pedicure toe separators to store bobbins. When making the measurements, if you do not want the paper on which you are noting down to fly away, put them below washers. These washers act as pattern weights. You can use coins also as pattern weights in a pinch. To get a uniform seam allowance, tie two pencils together side by side and start to draw. When you need to store the pins and needles, use steel wool to stuff the pin cushions. These keep them sharp and shiny. 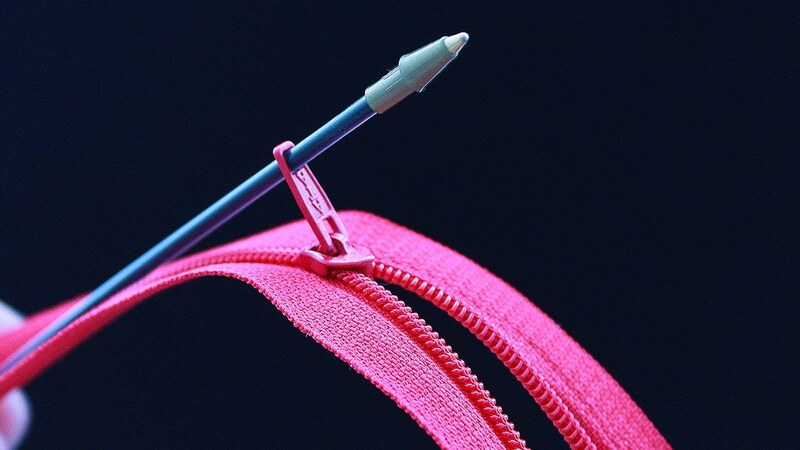 Use a bodkin handy to feed elastic through a waistband or seam. If you do not have one, get a safety pin. It works equally well. If you want to keep the fabric together, do not use pins for fabrics like leather. Pins can make visible holes and damage the beauty of it. Instead, you can use binder clips. They will not only hold the fabrics together but also give you a good finish. If you do not want your fabric to get frays at the edges, cut them with pinking shears. This will give your fabric a neat and clean look. Are you tired of the buttons falling out every now and then? Well, here is a special trick for you. After stitching on the buttons, apply a coat of clear nail paint. This will keep the threads in place and hence the buttons as well. Need a pin cushion? Use a bar of soap. Use a bias tape to fake a hem. When you are sewing, you must have come across the situation when you misplaced your scissors or could not find it. Here is something that will change your life forever. Tie the pair of scissors around your neck. Thus, you will always have them around you and will never have to fumble for them. Need batting for quilts? Use old blanket. If you are using a slippery fabric, it will pose many problems while cutting. So, it is advised that you put a layer of muslin under the slippery fabric and pin the layers together while cutting. Between buttons and embellishments, the fabric gets wrapped in layers. So you can use a hair straightener to press that area. When drawing lines on fabric, use soap instead of chalk. Thus, the lines will be removed when you wash the clothes, and not get stuck between the threads. If you have pins, needles, and thread that you always keep needing, then keep it in a matchbox if you are always on the run. Thus, you won’t need to keep hunting your entire case whenever you are in a hurry. If you have got a big spool for your sewing machine, it will keep rolling away and create a big nuisance. Keep it in a mug for easy use. When stitching a button, if you fear it might rip open the button hole, pin it so that you do not get a big hole. If you are also among the ones who keep losing their rulers, it is time to end that pain. Attach a tape measure to the edge of your sewing machine. Thus, it will be easy for you to take measurements in case you misplace your ruler. When sewing buttons on a coat, try to put extra buttons inside the coat sleeve so that if you ever lose a button, these will come handy. You won’t need to go hunting for the buttons that match your old ones. If you want to cut out patterns, use freezer paper. Press them on the fabric. Thus, it will stick to the fabric. Then you can cut out the fabric without using weights and without cutting out the pattern pieces. In case you have to print photos or designs, you don’t need to worry about the budget. No more need to buy expensive fabric. Just soak the plain cotton fabric in a mixture of alum, washing soda, hot water, and fabric softener. Thus, you can get vibrant colors that won’t bleed out after every wash. When ironing clothes that have pleats, use bobby pins to hold the pleats. Thus, you can iron them easily without ruining the set design. When you are quilting on the machine, make use of sponges to move the fabric. If you just bought a pair of new scissors, chances are they will be very sharp. For cutting clothes and thread, you do not need that sharp scissors. So it is recommended that you dull them using tin foil or sandpaper. So, this was a list of the most commonly used sewing hacks. You can obviously come up with your own. Make use of hacks and ease up your life.